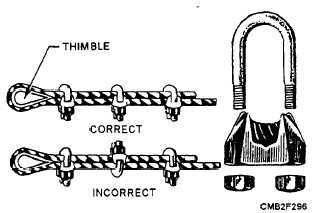 Home > Construction Training Manuals > Construction Mechanic Basic Volume 2 > Figure 6-55.Wire Rope Clips. Figure 6-55. - Wire rope clips. U-bolt on the bitter (dead) end, not on the standing part of the wire rope. If clips are attached incorrectly, the standing part (live end) of the wire rope will be distorted or have mashed spots. A rule of thumb when attaching a wire rope is to NEVER saddle a dead horse. 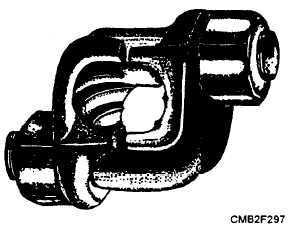 Another type of wire rope clip is the twin-base clip, often referred to as the universal or two clamp (fig. 6-56). Both parts of this clip are shaped to fit the wire rope, so the clip cannot be attached incorrectly. The twin-base clip allows for a clear 360-degree swing with the wrench when the nuts are being tightened. THIMBLE. - When an eye is made in a wire rope, a metal fitting, called a thimble, is placed in the eye, as shown in figure 6-55. The thimble protects the eye against wear. Wire rope eyes with thimbles and wire rope clips can hold approximately 80 percent of the wire rope strength. After the eye made with clips has been strained, the nuts on the clips must be re-tightened. Checks should be made now and then for tightness or the clips will cause damage to the rope. SWAGED CONNECTIONS. - Swaging makes an efficient and permanent attachment for wire rope, as shown in figure 6-57. A swaged connection is made by compressing a steel sleeve over the rope by using a hydraulic press. When the connection is made properly, it provides 100 percent capacity of the wire rope. Careful inspection of the wires leading into these connections is important because of the pressure put upon the wires in this section. If one broken wire is found at the swaged connection or a crack in the swage, replace the fitting. HOOKS AND SHACKLES. - Hooks and shackles are handy for hauling or lifting loads without tying them directly to the object with line, wire rope, or chain. They can be attached to wire rope, fiber line, blocks, or chains. Shackles should be used for loads too heavy for hooks to handle. 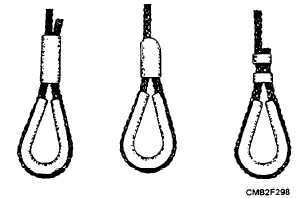 When hooks fail due to overloading, they usually straighten out and lose or drop their load. When a hook has been bent by overloading, it should NEVER be straightened and put back into service. It should be cut in half with a cutting torch and discarded. Hooks should be inspected at the beginning of each workday and before lifting a full-rated load. If you are not sure a hook is strong enough to lift the load, by all means use a shackle. Hooks that close and lock should be used where there is a danger of catching on an obstruction, particularly in hoisting buckets, cages, or skips, and especially in shaft work. Hooks and rings used with a chain should have about the same strength as the chain. Figure 6-57. - Swaged connections. Figure 6-56. - Twin-base wire rope clip.